The inauguration of Taiwan’s new president is an opportunity, not a crisis. Taiwan will inaugurate a new president this week who China hates but America should love. On May 20 Taiwan’s newly elected president, Tsai Ing-wen, will come into office amidst a storm of controversy and scandal. She will then begin a long hard slog through a cross-Strait political minefield, alienated from the world and increasingly unpopular at home. That is, if China’s communist government has its way. In recent weeks the People’s Republic of China (PRC) has raised tensions across the Taiwan Strait ahead of Taipei’s change of government, using a vast array of messaging channels to blame the incoming Tsai for the troubles. Nothing could be farther from the truth―Tsai has a moderate and low-key approach to politics. But that’s beside the point. In the foreign policy world perceptions matter far more than reality. China’s playbook will be to brand Tsai as a problem and drive a wedge between her and the international community. The actual problem is that the PRC wants to subvert Taiwan’s government and annex the island. China euphemistically calls this “reunification,” and has not given up the use of force to achieve it. The Communist Party is deeply insecure and views Taiwan as a threat to its legitimacy. Taiwan is a prosperous, vibrant democracy whose continued success undermines Beijing’s revanchist desire to secure absolute control over its maritime periphery. The outgoing president, Ma Ying-jeou, embraced the “One China” principle and paved the way for a flood of cross-Strait exchanges in his eight years in office. He is an expert on maritime and legal issues, but nonetheless sometimes acted in ways that complimented the PRC narrative in the East China Sea and South China Sea. Ma’s policies were not intended to serve Beijing’s interests. He is an anti-communist and a strong advocate for the Republic of China (ROC), the official title of Taiwan’s government. Ma even went so far as to suggest Taiwan has the right to claim all of mainland China’s territory because the PRC is an illegitimate government. Ma’s well-intentioned “One China” ideology enabled cross-Strait dialogues which produced over 20 trade agreements. These deals enjoyed the support of the majority of Taiwanese people, especially early on. Yet his approach eventually fell out of step with the surging tide of Taiwanese identity in his country. Approximately 84 percent of people in Taiwan now self-identify at Taiwanese (instead of Chinese) and view cross-Strait ties as relations between two separate countries. Increased Taiwanese familiarity with China since 2008 has only bred contempt. Nor did China return Ma’s gestures of goodwill. The buildup of ballistic missiles and other offensive weapons aimed at Taiwan continued apace throughout his administration. Taiwan’s ability to participate in the international community has been further restricted. And unfettered trade with China, instead of strengthening Taiwan’s economy, only made it more vulnerable. The newly-minted President Tsai will take a different tack. She has no interest in putting her political capital into an account that yields no interest and allows for no withdrawals. Recent history demonstrates that investing in China instead of other more profitable relationships would be a costly mistake. While cross-Strait relations will continue to be important, Tsai is likely to focus her foremost energies on economic and military reforms at home, while strengthening partnerships with the United States, Japan, Australia, India, and other democracies abroad. From the U.S. perspective, her presidency could not have come at a better time. The United States and China are now firmly entrenched in a competition for dominance over the Pacific Rim, and Taiwan is a center of gravity. The island is located in the world’s busiest maritime and air routes, and it serves as a defensive barrier for keeping Chinese naval power in check. The United States does not covet Taiwan as a base for its military, but it does require that the island remain in the hands of a friendly government. If Taiwan were lost, other Asian allies could be held at risk by the threat of Chinese blockades. As such, any PRC attempt to gain control of Taiwan would most likely be regarded as an attack on the vital interests of the United States, and repelled by any means necessary, including military force. Taiwan is critical to the United States not only for its location, but also for its shared values and its position as a key trading partner. Taiwan is currently the United States’ ninth largest trading partner, ahead of Saudi Arabia, India, and Brazil. Experience has shown senior U.S. policymakers that nations that share democratic values are the best partners and worth defending. Common values generate common interests, which are the basis for making a common cause in addressing global challenges. Unfortunately some American ‘China Hands’ have been advocating peace in the Taiwan Strait at any price and seeing crisis where they should be seeing opportunity. 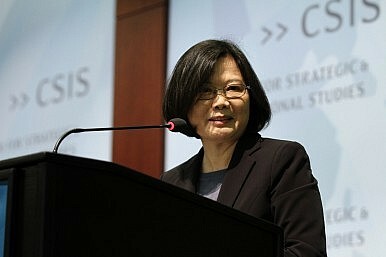 They have been urging Tsai to come up with a new “One China” formula to appease China. That would be a mistake. Better to have the old flashpoint return than to see Taiwan fall into China’s orbit. Going forward, Taiwan deserves the full-throated support of the U.S. government and all the material help the United States can give a fellow democracy in peril. If Washington stays complacent in the weeks and months ahead it will telegraph complicit agreement with China’s false assertions that Tsai is a troublemaker. Bowing to Chinese coercion would forsake the democratically represented will of Taiwan’s citizenry. Tsai is a cool and calculating centrist. The greatest risk she presents is not that she will be a ‘pro-independence’ firebrand, but rather that she will be too cautious and slow to embrace strategies and initiatives needed for helping compete with China. Now more than ever, the United States needs strong friends in the Pacific who know how to play hardball. If Washington can convince Tsai that America has the backbone to stand up to China, Taiwan will be right at our side with an immense ability to contribute more to the common good. The coming political transition in Taipei is a strategic opportunity, not a crisis. It should be treated as such by all but Beijing. Ian Easton is a research fellow at the Project 2049 Institute, a think tank focused on security issues in Asia. China's unilateral announcement of new flight routes should spark a rethink of Tsai's cross-strait policy.